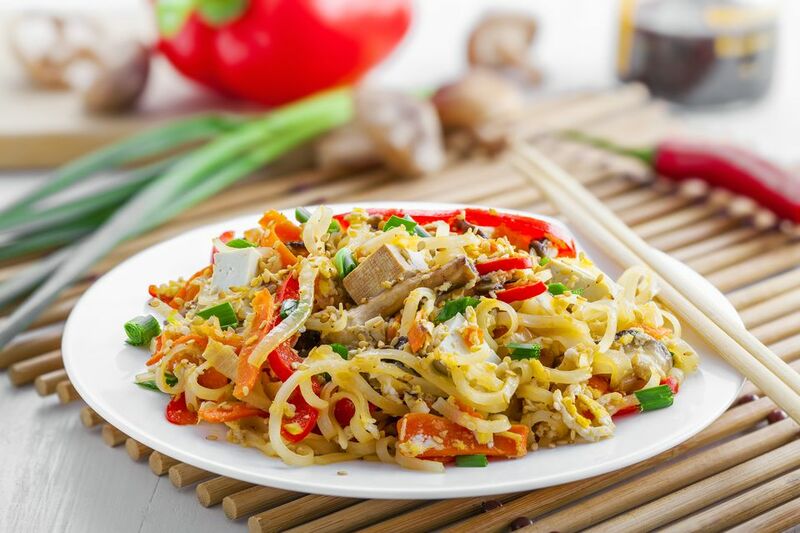 An authentic pad Thai recipe usually has tamarind juice or pulp to give it a distinct orange hue and sweet flavor. Tamarind can be hard to find, however, depending on where you live. Try this easy vegetarian and vegan version with tofu instead. Scroll down for more Thai noodle dishes to try. Note: Need this vegan Pad Thai to be gluten-free as well? Just use a wheat-free soy sauce substitute, such as tamari or Bragg's Liquid Aminos. Whisk together the soy sauce, peanut butter, lime juice, hot sauce and sugar. In a large wok or skillet, sautee the tofu, onion and garlic in sesame oil for a minute or two, stirring frequently. Allow to cook for another minute or two. Add the cooked noodles and the peanut butter and soy sauce mixture. Stir well, and allow sauce to thicken as it cooks for about 3 minutes. Top with peanuts, bean sprouts and green onions and serve hot.